Vacations in the White Mountains, as you may know by now, are usually full of adventure if done right. Beautiful mountain views, cascading waterfalls, outstandingly clean swimming spots, local attractions, and amusement parks are just a few of the things on the bucket list. With an itinerary like this, you're going to need a hearty breakfast every day to give you the sustained energy you need for a fruitful vacation up north. Unfortunately, a lot of guests come up and start the day off with something a little... less appetizing. Dry scrambled eggs that sat in a chafing dish all morning, watered down cup of joe, and a mini box of cereal. Sound familiar? When on vacation, most people will take their free continental breakfast at the resort and move on with the day. If you’re planning on a full day of adventure in the White Mountains, you’re going to have to do better than that! Breakfast is the most important meal of day, as it gives you the energy you need for the morning. Don’t pack a granola bar in your bag and expect it will keep you going for a morning of hiking, amusement rides, water parks, ziplining, kayaking, and climbing! Make sure to hit these amazing breakfast spots to start off the day, and you’ll be good to go. 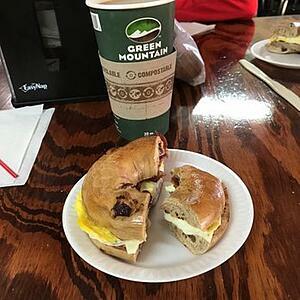 If you’re looking for a quick place to get an outstanding breakfast on the go, then White Mountain Bagel Company is for you. This little bagel shop in Lincoln, NH, is a counter service experience you won’t regret. You can enjoy bakery fresh bagels with 8 different cream cheese flavors including classics like veggie and more unique flavors like bacon horseradish or honey walnut! They also serve Boar’s Head deli meats and cheeses on their breakfast sandwiches and lunch sandwiches. They have more than just hot coffee! Try a chai tea latte, americano, cafe breve, or cappuccino with your breakfast. The best part? White Mountain Bagel Company is pet friendly. No need to leave Fido in the car while you go in to order your breakfast on the way to the mountain. If you’re looking for an “eggs benny” that’s out of this world in a classic style diner, then you’ve found your destination. Conveniently located near Clark’s Trading Post, the Sunny Day Diner is a local gem that’s open 7am-2pm every day in the summer and weekends in the winter. 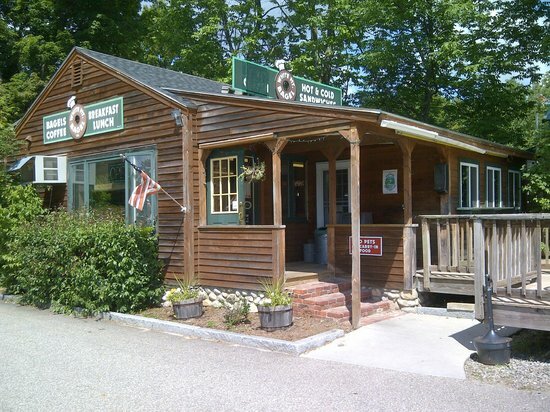 Yankee Magazine featured this little diner as the best in New England! Try out their “secret recipe” homemade pancakes with real maple syrup. 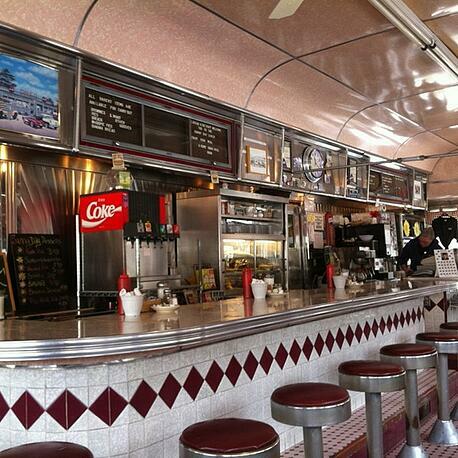 The Sunny Day Diner is the place to go for a retro, modular diner feel in the White Mountains. 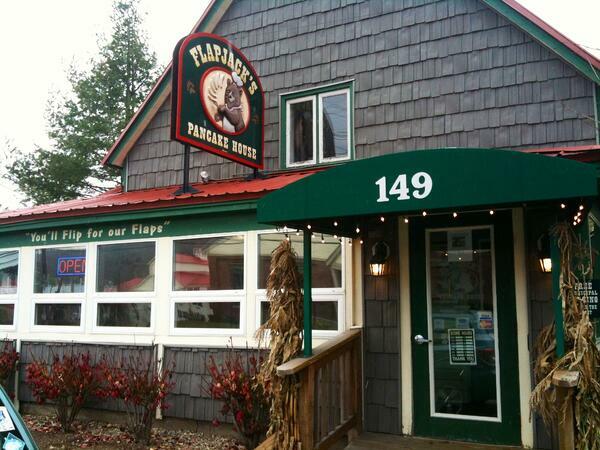 Flapjack’s in Lincoln, NH, is a famous pancake house with lines out the door every weekend. If you don’t mind a little wait for some amazing breakfast, Flapjack’s is it. This restaurant was created seven years ago by a retired couple who made their own home into a pancake house! Now it is one of the hottest joints in Lincoln for their delicious breakfast cuisine. Flapjack’s has pancakes in a ton of flavors like chocolate chip, blueberry, strawberry, raspberry, and more. 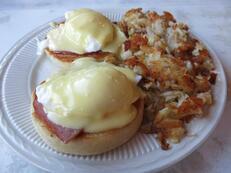 They also offer breakfast plates, omelets, eggs benedict, and most any breakfast you could ask for. They are open Thursday to Monday, don’t miss out on a great meal! Woodstock Inn is a triple threat staple of the White Mountains region where you can get an amazing meal for breakfast, lunch and dinner. They also have a well-known brewery that offers tastings, tours, and the occasional beer yoga session! For breakfast, enjoy over a dozen different types of eggs benedict, The Wonderful Wizard’s Waffles, and a unique variety of pancakes and french toast. 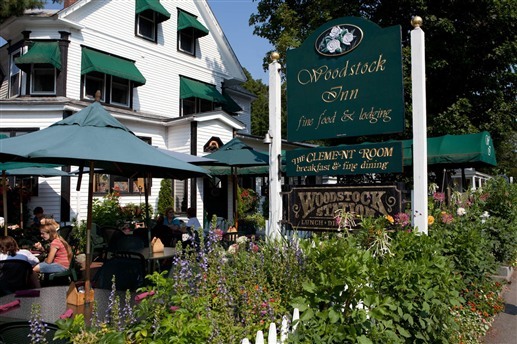 Woodstock Inn is centrally located in downtown Woodstock near the park, the river, and the local shops. This is the perfect way to start your day of exploring what downtown has to offer! If your tastebuds are searching for some creative and local, Woodstock in should definitely be your choice. Also located in downtown Woodstock, Peg’s is a local favorite for a good old fashioned breakfast. This is a no frills, quality breakfast experience. Bring yourself back to Sunday morning breakfasts with your family getting eggs over easy, toast, and bacon for a simple but delicious meal. 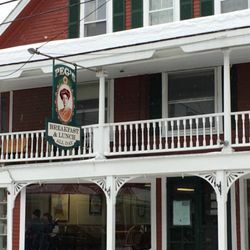 Peg’s has high nostalgic factors, outstandingclassic breakfast, and a friendly crew that makes you feel right at home. 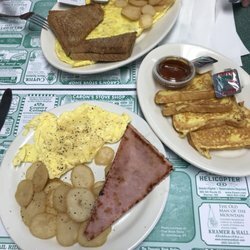 They’ve been open now for over 33 years, so you could say they know their way around breakfast by now. Lastly, The Toast at La Vista is the traditional breakfast of your dreams. 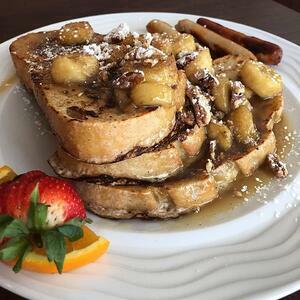 Located right inside RiverWalk Resort, this spot is known for their breakfast cantina burritos, eggs benedict, and Bananas Foster French Toast. 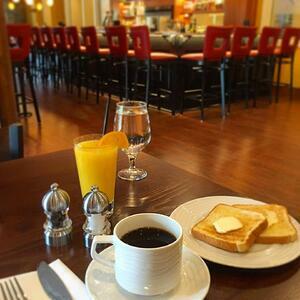 The Toast at La Vista seamlessly combines classic breakfast foods with La Vista style cuisine. In the afternoon, The Toast transforms into La Vista Italian Cuisine. Try something new and enjoy the atmosphere of friendly people and homemade recipes. With options like these, there is no reason to settle for an average breakfast in the White Mountains. Whether you’re on the go, or looking to settle into a booth and chat, there’s a place for you to enjoy your morning over delicious cuisine. This time of the year is great for trying out all the local flavors. Reserve your suite at RiverWalk Resort now before everything is booked!